The first thing I noticed about Michele’s well-stocked shop is how cute and creative her products are. The second thing I noticed was the variety of items. This WAHM (working-at-home mom) has a lot to offer…cloth diaper covers, receiving/swaddle blankets, girls’ skirts and dresses, cloth wipes, beanies, wet bags, loveys, crayon wallets, pacifier clips, and more! Michele also is open to custom orders, so contact her on Etsy or on her Web site if you have anything in mind! 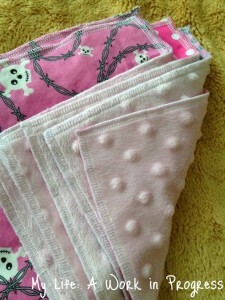 Michele sent me a set of six cotton and minky-backed cloth wipes to review. 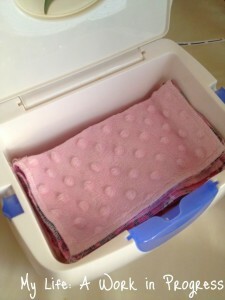 If you’ve never used cloth wipes, read my post on using cloth wipes and wipe bits solution HERE. Cotton on one side- minky on the other! The set comprises two wipes with polka dots, two wipes with black and pink skulls, and two wipes with skulls and barbed wire. 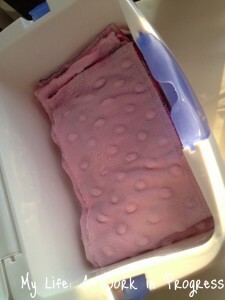 The back of each wipe is made of a light pink minky fabric. 3 different coordinating cotton prints. 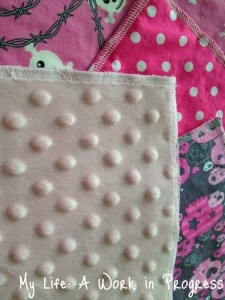 Light pink minky on opposite side of each. Each wipe measures 8″ by 8″, so they’re quite large. In the photo below, I’ve placed one of the Zookiescrafts wipes underneath an OsoCozy wipe, so you can see the size comparison. 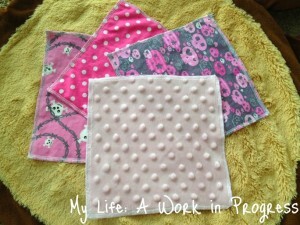 I love minky fabric for babies (and myself!). Minky is a very soft, plush, silky-feeling microfiber fabric. It’s generally made of 100 percent polyester. We used these wipes to clean Baby J during changes. We also used them to wipe his runny nose, and his face after he ate. I grabbed one and used it on his high chair tray a couple times, as well. Each time, the wipe worked great for the task. I prefer cloth wipes over disposable, because I think they generally do a better job of cleaning messes. The minky side was very soft against my son’s skin, but the cotton side was fine as well. 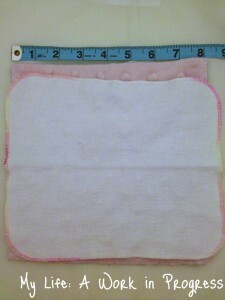 We have other cloth wipes that we use, but these ones by Zookiescrafts are definitely thicker and a little bigger. So all in all, they cover a larger area and are more absorbent. And they look adorable! One of the many reasons I chose cloth diapers over disposables is because they’re so much cuter. Why not have the same with our wipes? The wipes fit nicely in our wipes warmer without having to do any rearranging or weird folding. Zookiescrafts is having an inventory reduction sale right now! Check them out on their Web site HERE. For updates, follow Zookiescrafts on Facebook and Twitter. Michele is sponsoring a prize for the Bellies to Babies giveaway hop event that starts this Saturday, January 5! Get a head start on your giveaway entries, by following Zookiescrafts on Facebook and Twitter at the links above! Note: I received a complimentary set of cotton and minky-backed cloth wipes by Zookiescrafts to review and was not compensated for this post. I was not asked to write a positive review, and the opinions expressed above are my own and may differ from those of others. These look very nice… I love the minky fabric too!